Mackenzie Hart at her graduation from the New Jersey Youth ChalleNGe Academy, Sept. 2015, pictured with Acting Gov. Kim Guadagno and Adjutant General of New Jersey Brig. Gen. Michael J. Cuniff. Photo courtesy of the US Army National Guard, Staff Sgt. Nick Young. 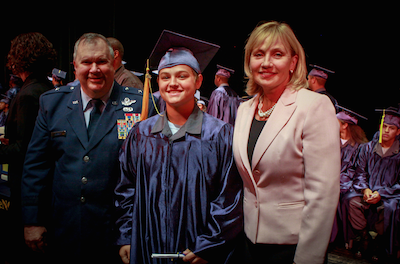 NEW JERSEY – There are some students who feel the spirit of the military is within them from a very young age, and they seek the challenges and discipline of what it has to offer. One of these young students is Mackenzie Hart, 17, from Hardyston. She was seeking a different angle to her high schooling that would blend academic studies, citizenship, leadership skills, physical fitness, helping in her community, team building skills and other qualities that build life skills. Sussex County High Schools do not currently offer military type of programs, such as a JROTC (Junior Reserve Officer Training Corps through the United States Armed Forces). Then a family friend suggested to Hart about the New Jersey Youth ChalleNGe Academy, which is comprised of a scholastic curriculum, along with a 22-week rigorous, residential, military style program. Cadet Mackenzie Hart. Image courtesy of Kelly Hart. 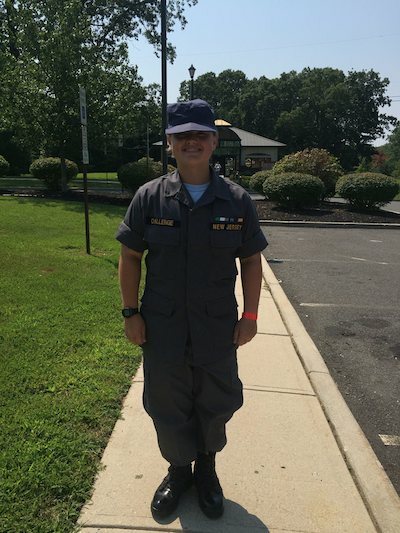 As soon as Hart learned of the program, she realized this was something that could help to build up her skills in a way that she sees fit to lead to a career in the military that she is seeking. But with this type of a program comes sacrifice, and that means leaving behind one’s family and friends for a stay in Ft. Dix, NJ, through the program that is coordinated through the State of New Jersey Department of Military Affairs. It is a tuition-free program open to all residents of New Jersey, who are legal United States residents between the ages of 16 and 18. It is a totally voluntary program. Students who choose to enter withdraw from high school to focus on this intense curriculum, and can earn their GED (General Education Development) for equivalency to their high school diploma, and later enroll in college. They must also have no pending legal issues, and be alcohol and drug free in order to enroll. Hart was selected to enter the program after she applied for Class 42, and looked forward to the experience ahead following her acceptance. She is reportedly the first student from Sussex County to have entered the program and graduated. 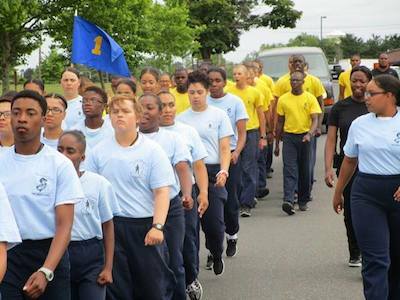 As the military has boot camp, the New Jersey Youth ChalleNGe Academy has its own intense two-week “acclimation” program, with concentrated physical fitness training, lessons in social discipline, drills and other facets of the program. At this stage, the entrants are considered “”candidates.” After acclimation when candidates metamorphose into “cadets,” the residential phase commences. It is comprised of 20 weeks of academia, physical training, job skills training, and mentoring by military personnel working with the cadets to help lead them successfully through the program. Past graduates of the program have noted on the organization’s Facebook Page, how the ChalleNGe Academy has positively impacted their lives. For some, it directly paved the way to a military career. One mother reported on Facebook that both of her children were separately enrolled. Her son, she said, was studying in a Medical Assistant program, and her daughter applying for work after she graduated. Her daughter was battling medical issues, and initially asked to be picked up because she was in pain during her acclimation phase, but pushed through and adjusted beautifully. Mackenzie Hart (third from front) marching with her class. Image courtesy of New Jersey Youth ChalleNGe Academy Facebook. “It was like a dream to see her so joyful, respectful, and a grown up woman,” this beaming mother wrote. Hart said that the most difficult part of the acclimation phase, was not being able to speak to her mother, Kelly. For Kelly Hart, she also experienced the same, hoping for a picture on Facebook from the academy, to see how her daughter was faring, the one way how parents were able to potentially view their children. During acclimation, there was no contact between the candidates and anyone outside of the program. 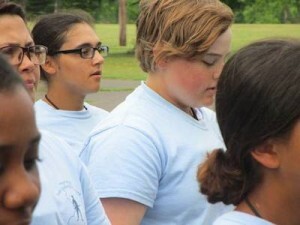 Mackenzie Hart during the New Jersey Youth ChalleNGe Academy. Image courtesy of the New Jersey Youth ChalleNGe Academy Facebook Page. Eventually she did allow friendships to grow, following her acclimation period. During her days at the academy, Hart said that as candidates, and later cadets, each rose daily at 5 a.m. and began physical training five days weekly a half hour later. Other details throughout the day included scholastics, cleaning their living quarters, shining their boots and ensuring their uniforms were impeccable. Like the military, should their space, or even their attention to hygiene or their uniform not be flawless, privileges and items were taken away (such as if a bed was not properly made, bed linens were taken away for that night, and cadets would sleep on their plastic-covered mattress). Happily reunited with her sister, Morgan. Image courtesy of Kelly Hart. “You had to earn everything,” Hart said. Acclimation was the most painstaking of all periods, with students standing outside in the sun for training for 16 hours straight. With her brother Matthew, on a weekend home. Image courtesy of Kelly Hart. 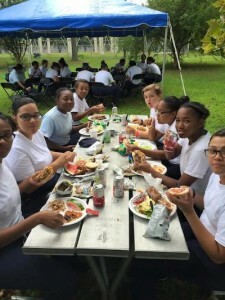 During her stay there, Hart found her niche, and that was being an encourager to her fellow cadets in physical training and their eating habits, fostering in her peers the ability and desire to take better care of their health. As a group overall, the females of this class (all classes are separated by gender) celebrated a collective loss of 800 pounds. They also commemorated their milestones in physical fitness, which for Hart, included running a mile in eight minutes and nine seconds at the end of her stay, after completing the mile run in 15 minutes when she first entered. She also served for a period as commander of the Color Guard during her tenure in the program. Hart notices the change in the way that her daughter carries herself, and the decisions she makes, which reflects a new level of maturity. Volunteering with Habitat for Humanity. 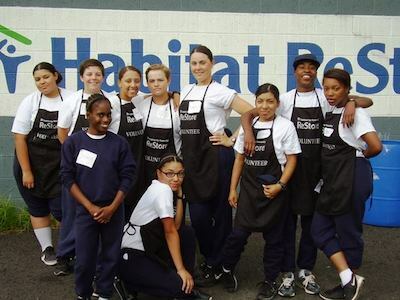 Image courtesy of the New Jersey Youth ChalleNGe Academy. In addition to her family, there are several who have guided Mackenzie Hart through her exciting journey with the New Jersey Youth ChalleNGe Academy, including her platoon and staff sergeants that she has been truly appreciative to. While there, cadets performed acts of service in the community, volunteering their time to various organizations. There were some excursions for pleasure too as a reward, like trips to the zoo and beach. Mackenzie Hart enjoying a barbecue event with her classmates. Facebook Photo courtesy of the New Jersey ChalleNGe Youth Academy. What is next for Hart now that she has completed the academy? In addition to seeking a job, she plans to volunteer in the Sussex County community, and begins on Thursday Oct. 8, committing to lend her helping hands to one of the local food pantries. 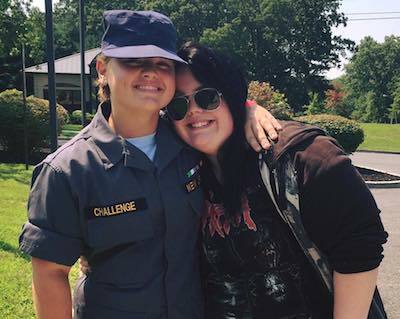 After earning her GED, Hart will enroll in Sussex County Community College, with eventual plans to transfer to a four-year institution and to enter the Air Force. Interested in further information about this life-changing program? 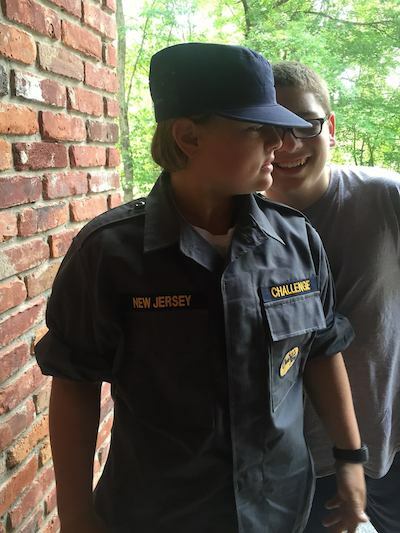 Click here to learn more about the New Jersey Youth ChalleNGe Academy. Did you enjoy reading this story? Then stay on the scene with NJInsideScene.com, and check out our other feature stories and news from around the area. Click here to follow us on Facebook.